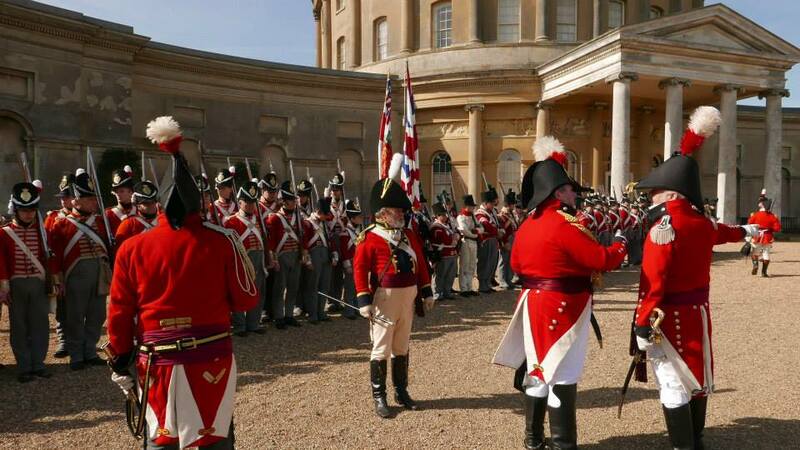 With June not far away, this Ickworth weekend was the penultimate opportunity to train alongside, and renew acquaintances with, the Regiments of 2 Brigade with whom we will be fighting together at Waterloo. 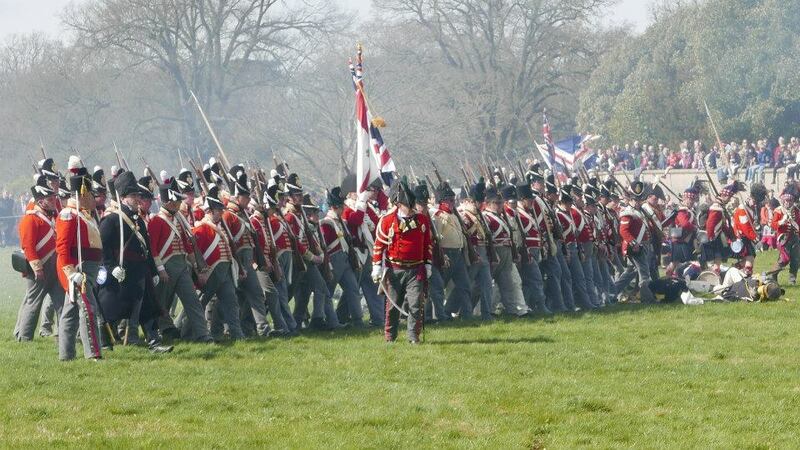 Importantly, particularly for the 32nd, it was also the opportunity to mark as a Brigade the major contributions made by Tiny to the re-enactment movement – both overall and at a very personal level. Led by ‘the Colonel’, the 32nd were also represented by Wendy, Nichola, Sue, Adam, John, David and Bob. Having travelled up to Bury St Edmunds on the Friday in bright warm sunshine (roof down all the way in our “dashing young Ensign’s” MX-5) the weather took a significant turn for the worse soon after our arrival at Ickworth. An overnight temperature of 4 degrees on Friday night (and even lower on Saturday night) created our first of many challenges – compounded by rain and a cold wind on Saturday and even stronger winds on Sunday! The 32nd is, of course, a ‘man’s regiment’ (well nearly!) and so this all did little to dampen our true spirits (helped by a few handy hip flasks!). 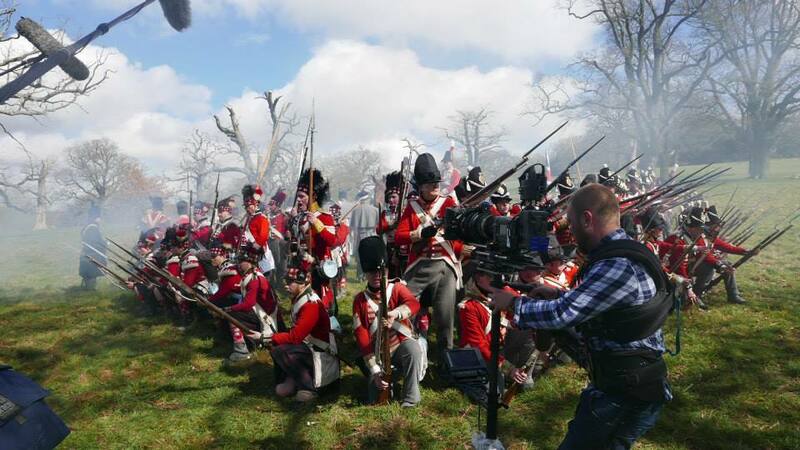 The Saturday timetable appeared relatively undemanding – in the morning a bit of filming for some units, some brigade drill and all culminating in the afternoon with a skirmish in the open area of Ickworth Estate. All these things were true. However the combination of an over-enthusiastic film director, wet and windy weather, a vast undulating Ickworth Estate and a constantly retreating French enemy resulted in a very long and exhausting day – described by many ‘old campaigners’ as the hardest day in the NA’s recent history. We returned to camp at 17:30, weary but with our Regiment intact, the French well beaten and with an experience which will stand us in good stead come the anticipated rigours of Waterloo. Our newest camp-follower, Sue Llewellyn, took responsibility as ‘victualler-in-chief’ for the weekend and did an amazing job throughout – thanks Sue – and then saved ‘the best ‘til last’ with freshly baked ‘drop scones’ for Sunday lunch / tea – fantastic! Son David was also at his first ‘proper’ event, enjoyed himself and set a great example for many more senior in years to himself. 10 o’clock Sunday morning was “Tiny time”. 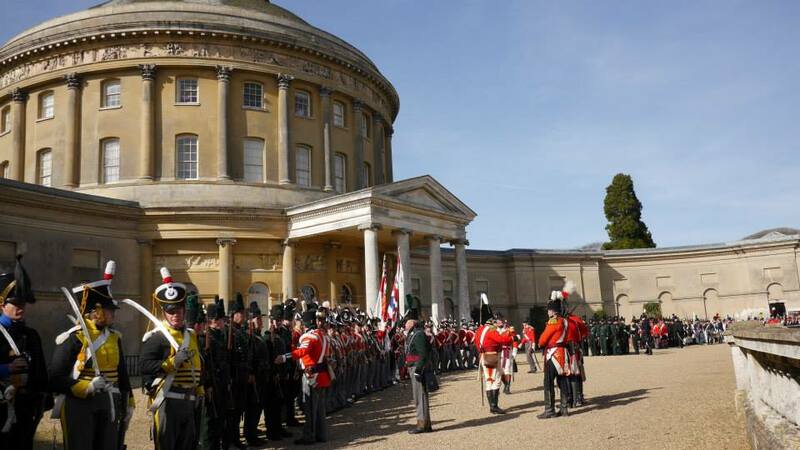 Approximately 150 officers and men paraded in front of Ickworth House and after a few warm words about Tiny from Brigadier Ed Parker the air was torn apart by a single simultaneous gun volley from an estimated 120 muskets & rifles. This was followed by a general salute, a perfectly sounded ‘Last Post’ from a lone buglar (our own Eddie) and a minute’s silence – very moving for us all and surely a very proud moment for Tiny. 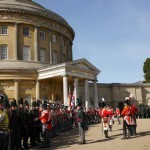 Brigade drill followed with a variety of manoeuvres on the front lawn of Ickworth House – which seemed to work most of the time and there were sufficient troops to successfully “form square”. Our last active event of the weekend was a battle with our ‘French foe’ in the main arena – fortunately a much smaller area than used on Saturday which created an excellent atmosphere of smoke and noise for a significant crowd. Despite being part of the “Forlorn Hope” most of the 32nd managed to come through unscathed – and the colour successfully defended. The French were once more routed. Throughout the weekend we again worked closely with our friends of the 43rd and greatly enjoyed their company. 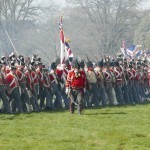 We also made new friends in the form of the East Norfolk Militia who were attending their first NA event. Of particular note was their Ensign who seemed determined to charge the French single-handed and armed to the teeth with his King’s Colour, sword and pistol – fortunately being restrained by our Colonel before he could get too carried away. 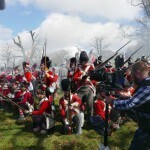 Overall, another great weekend with some excellent experience ahead of our meeting with Napoleon at Waterloo in June. Many thanks to all who made it happen. Special thanks to Alan Balding for the photos too!